For Part One of this series, check HERE. For Part Two of this series, check THIS. For Part Three of this series, check HERE. The view of Bora Bora from the air is truly breathtaking. As we were landing, there was water quite close to the runway on both sides. The airport, built by the US forces in 1942, is located on a palm fringed motu about 20 minutes by boat from the main village of Vaitape. Of course, the landing merely added to the thrill of finally arriving on Bora Bora. Just the name itself conjures up magic, doesn't it? Everyone on the plane was excited. And no matter where you're staying on Bora Bora, after the plane lands on that little spit of land, you have to take a boat to your hotel. 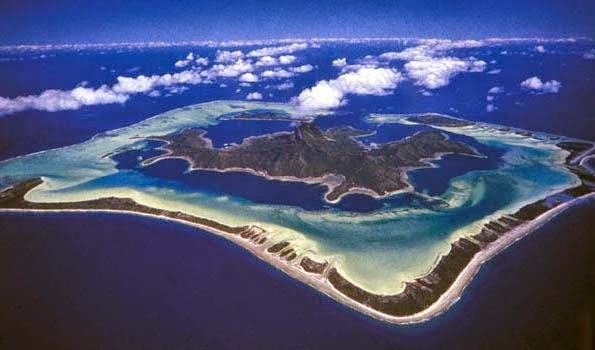 The island, located about 230 kilometres (140 mi) northwest of Papeete, is surrounded by a lagoon and a barrier reef. In the center of the island are the remnants of an extinct volcano rising to two peaks, Mount Pahia and Mount Otemanu, the highest point at 727 metres (2,385 ft). The permanent population of Bora Bora is 8,880. Most of the temples (Marae) have been destroyed during the last century by the English missionaries, and unfortunately there are little archeological remnants left. We stayed at the Hotel Bora Bora. It's an Aman resort. We took some razzing from friends we traveled over with, but we didn't care...it was worth the splurge! As with so many hotels here, I see on their website they are remodeling. Not that I thought they needed it, as we loved our bungalow. So some of my photos might be dated. This time, we weren't overwater, but it didn't bother us a bit. You'll understand after you see the slideshow. I mean, how elegant can a bungalow get? The main village is Vaitape and is set at the foot of Mount Pahia. It is the island’s commercial and administrative centre. 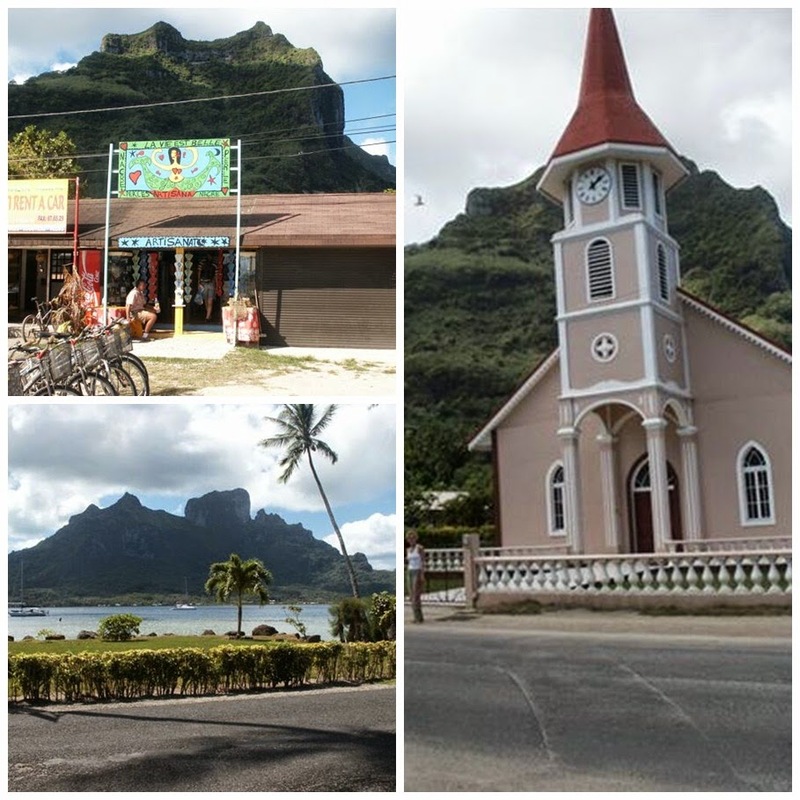 There is just one main road around the island, and it goes through Vaitape, past assorted churches whose bells peal loudly on Sundays. No stoplights though there is a stop sign. Complimentary shuttle from Hotel Bora Bora to town was available once a day. Of course, who could resist lunch at Bloody Mary's? Tracy is standing by a plaque listing all the famous visitors. (BTW: the place was jammed with cruise ship passengers.) And why is she pointing to Pierce Brosnan's name? Well, there's a bit of a story behind that. The second day we were there, we noticed extra security. Someone soon told us Pierce Brosnan had arrived. Ta Da! We were given to understand he and his family are frequent guests at this hotel. Everyone practically fell down groveling. Not that we were completely ignored, but close. We did see he and his wife in the hotel bar a couple times but noticed they didn't eat there. I don't blame them, the food was ghastly. We actually complained. An Aman resort with bad food?? Hard to believe. She did not see any leopard rays at the one area where they frequent. Snorkeling was fairly good here and Tracy took me snorkeling to a wall that scared the life out of me. I thought the bottom was dropping out (it was) and it's very disorienting when you can't see the bottom at all. We saw both turtles and rays while snorkeling. We discovered lots of shops and boutiques scattered about the island. Always ask for shopping information at reception and any staff you speak with. There are hidden gems only they know about. We would never have discovered one fabulous little jewelry boutique with unusual island pieces if we hadn't asked someone for suggestions. It was quite out of the way. Take a look at this little necklace. (I enlarged the photo so you could see the intricate work.) 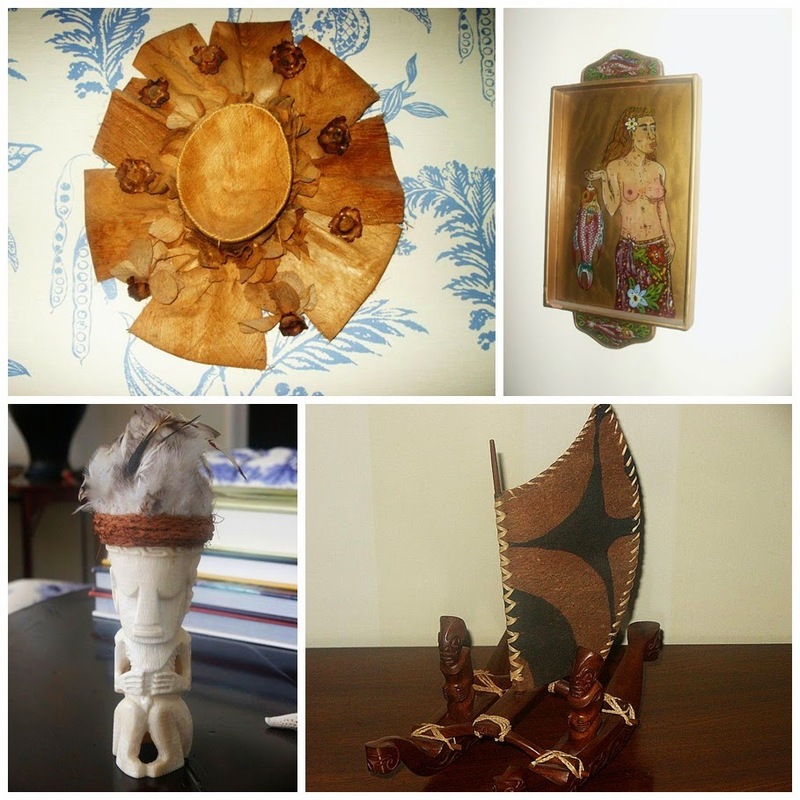 It's hand made with a coconut fiber called coir. It's not just a single piece, but thin strands are wound round and around. 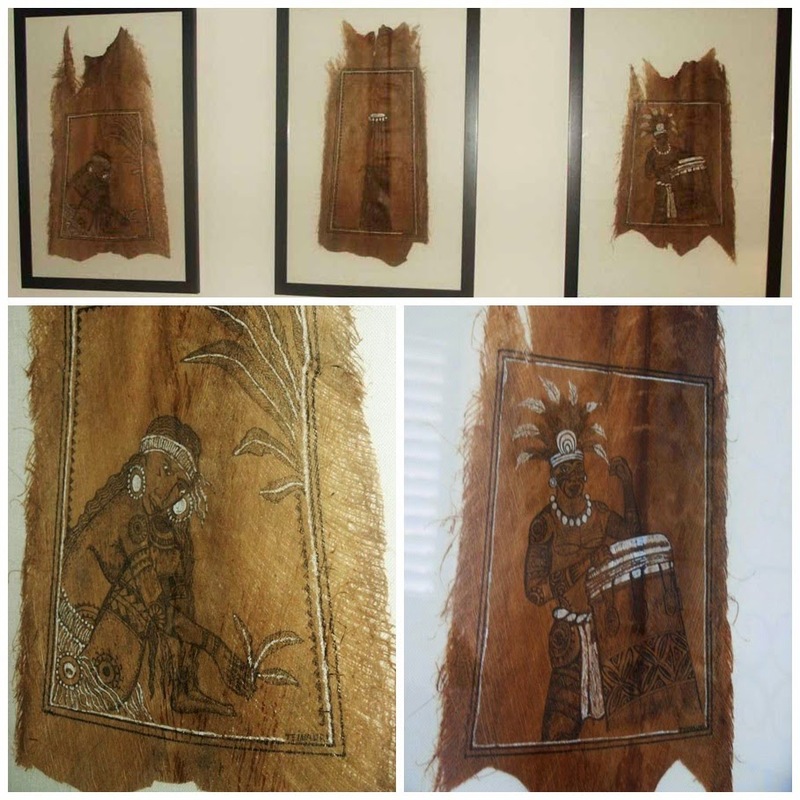 The necklace is a really small piece but the coir work is extremely intricate. Unfortunately, most things at this particular shop were terribly expensive because they were so work-intensive, but each of us bought a simple necklace. 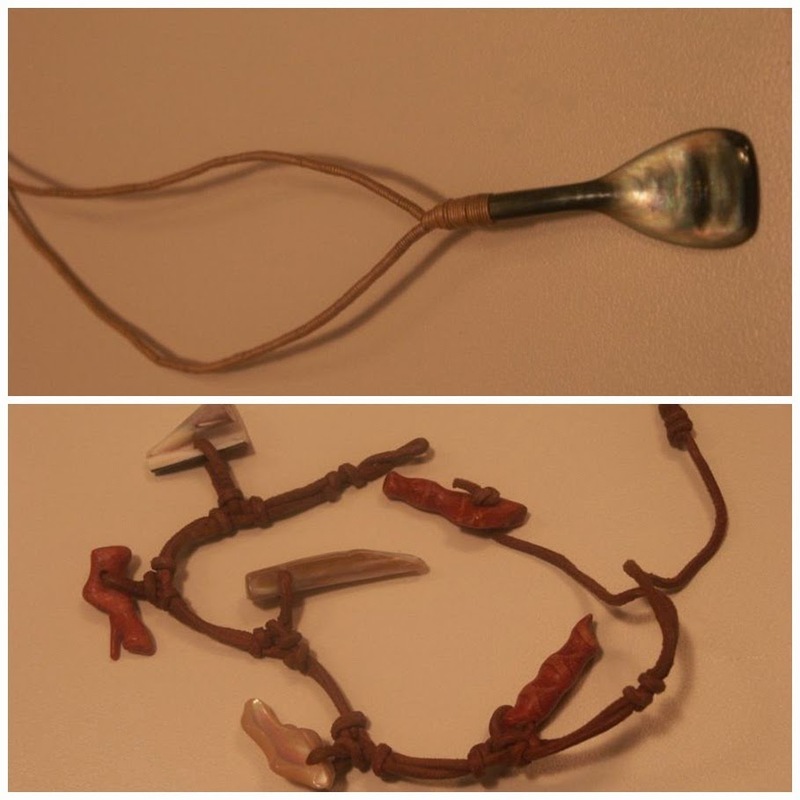 The bottom photo was a funky (and cheap) ankle bracelet. One of the shells hooks into the loop to keep it attached. I wear it often in the islands on the beach. We discovered a gallery that had some lovely things. The tray with the bare-breasted woman has thin glass liner over the art work and is only about 1 foot long. She hangs on a wall in my den. And in the same gallery, off in a corner, a basket contained some tightly rolled up drawings on coconut husks. I couldn't resist, brought three home and had them framed. I'm not going to list names of shops because things change so quickly and it's been a few years; I imagine the shopping (and hopefully the food) has been improved even more. After all, Bora Bora is a cruise ship stop; that ought to warrant expansion. So all in all, shopping is fun on this island....and also at our hotel. We loved our bungalow and for the first time on this trip took advantage of the wonderful spa. It's a shame our dinners weren't good. We had made friends with the manager and after hearing what we thought, actually said: "food is not that important to our guests." What a wrong-headed comment! I don't know, is it because we're both foodies? Or perhaps honeymooners don't really care about food :), but there weren't very many honeymooners at this particular resort. I imagine it's difficult to find chefs for these out-of-the-way islands, although our first two had excellent food and so did our final stop: Taha'a. What a wonderful place and thank you for making us a part of it with these beautiful photos! What?! Food isn't important?! Hello?! Otherwise, it looks fabulous. I'm pretty sure those celebs don't travel with a personal chef, and I bet they think food is important! Oh my, what a beautiful Island! The pictures look fantastic. I bet you had a great time there. What a beautiful place! Love all the pictures. Looks so fun. Thanks very much for sharing. What a beautiful place. A shame they don't care about their food. I mean really. I can't believe you had to actually complain in one place. They wouldn't last long in other parts of the world. 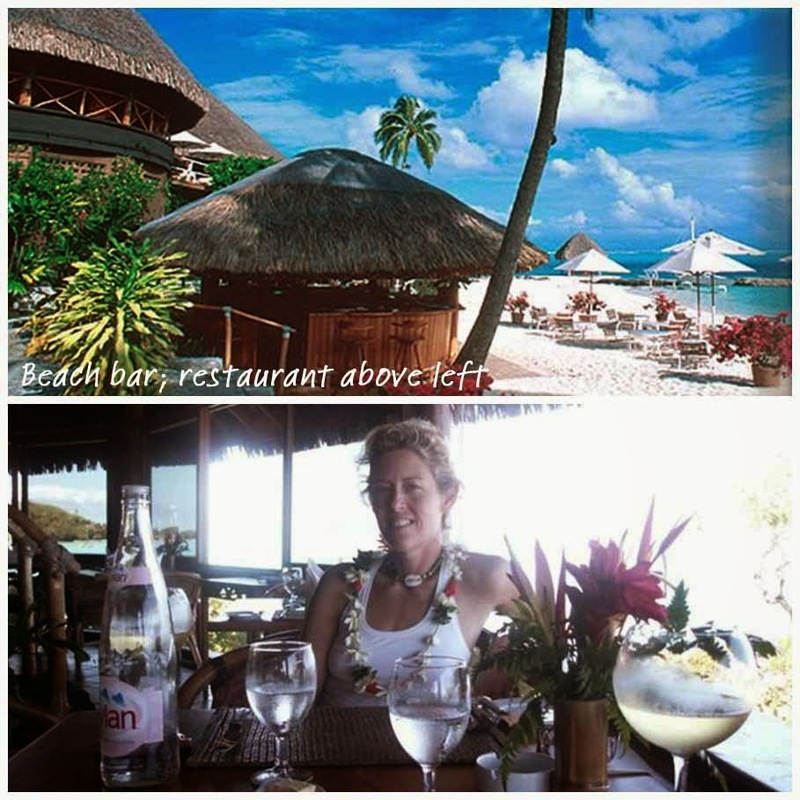 I enjoyed your review of Bora Bora and thanks for sharing. What a pity the food was not good but I loved the bungalow, looks very comfortable and lovely. Looks like a beautiful Island and somewhere I would like to escape for a few days, from our winter. I'm sorry the food was so disappointing but at least it sounds like you had fun anyway! Bora bora looks beautiful! Once I got over landing, I think I'd love Bora Bora. And what fun to say "I've been to Bora Bora" Too bad about the food. One would think lovely and deliciously prepared seafood would abound. Your cottage looks perfect. Beautiful floral touches. I am green with envy. I've always wanted to go to Bora Bora! Thanks for the virtual vacation! Sigh...Barbara, now I wish I was on an island holiday. The photos are so lovely, looks like you had your own private pool or was that the resort pool? Thanks for filling my day with a bit of sunshine (it's too cold at the moment!). I love your posts about French Polynesia. This one was so interesting. The hotel looks gorgeous, but what a mistake for them to overlook the food. Obviously it can taint the guests' feelings about the hotel if the food isn't what they expect. I'm looking forward to reading your next post! What a lovely place! How disappointing that the food didn't quite stand up to the scenery. Typically I love my little mountain town, but when the Sundance Festival is here and the place is filled with celebrities who expect to be catered to, it's absolute hell trying to get a table at a favorite restaurant or even a coffee at Starbucks! Bad food in such a beautiful area? o..that's just distressing. dream to be there one day. Sounds fabulous vacation! It looks like fun. Sorry about the celebrity interruption. That happened to us once with Harrison Ford at a hotel. We were non-exisistent. Enjoy and keep us posted! What a beautiful place and such a shame about the hotel food and that Mr. Brosnan had to hog the one good restaurant. I can't imagine that in a place so small he had to worry about being mobbed by fans. I have always wanted to visit those places!!! 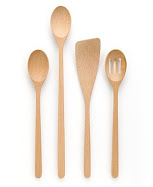 love them and you great blog!!! 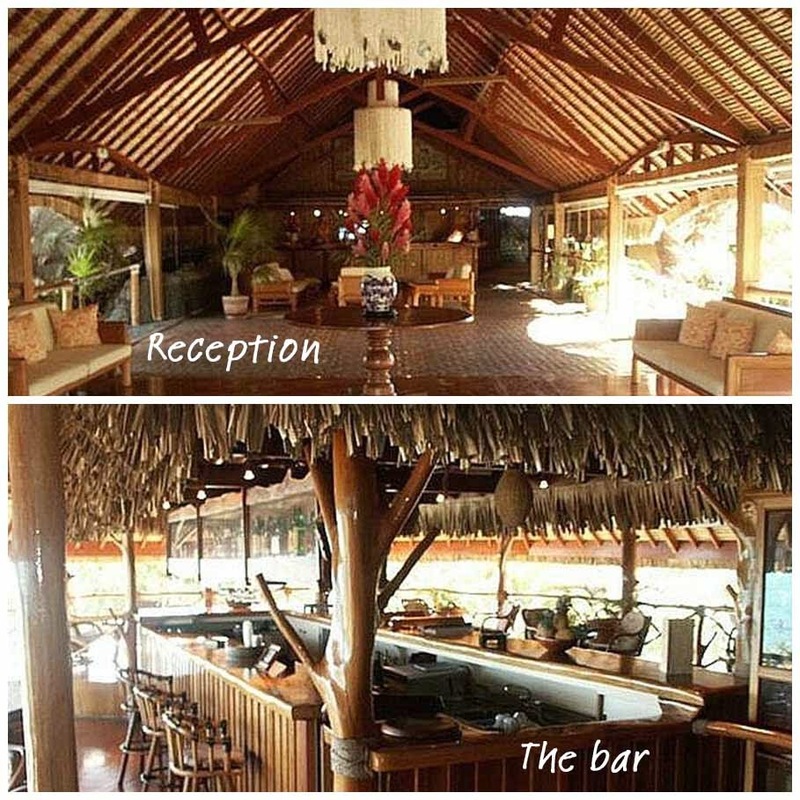 Perhaps the typical Bora Bora guests are just sitting at bars admiring the gorgeous scenery? Since they "eat up" the views, they don't get hungry? I had no idea how gorgeous it was there. Really a great adventure for you both. Barbara I am so glad to be seeing these posts! It is one of my life's ambitions to visit this paradise, and I am enjoying seeing Bora Bora through your eyes. I've run into Pierce Brosnan twice in my life, skinnier than I thought he would be, but still very dreamy. From the sky, Bora Bora looks like something from a dream! too bad Pierce Brosnan had to be in it! it must be difficult to get good fresh produce on the island for the cooks to work with--probably a lot of frozen and pre-fab foods, hence the ghastly meals. 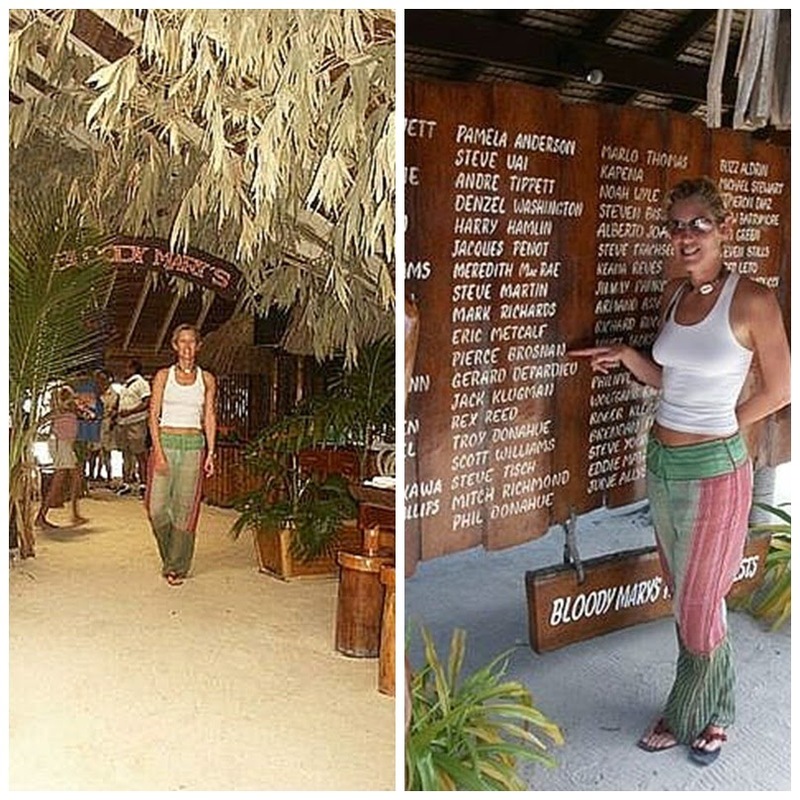 love reading about your and Tracy's French Polynesian adventures. What a gorgeous room. The diving sounds fabulous, too bad about the food. Who doesn't care about food.